John Phillip Crawford (the youngest child of Louise Crawford; grandson of John Smith Jr.) is married to Rie Yoshinaga. They had two wedding ceremonies. The first was in the U.S. on March 24, 2000 in the West New York, NJ Town Hall with a small group of family and friends. They later had a formal Japanese wedding in Rie's hometown in December 2000. Sean Kazuki was born in Holy Name Hospital, Teaneck, NJ on April 11, 2001. Born in Jersey City Medical Center, Jersey City, NJ on August 1, 1955. John was the second child to be named after his grandfather. Sadly, the first John Phillip Crawford was born to Louise on July 23, 1949, but died suddenly at 3 months old on October 20 from pneumonia after only a 1 day illness. 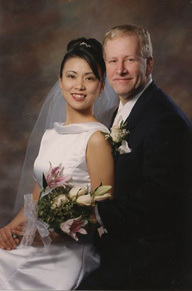 John was married to Rie on March 24, 2000. John was in the US Navy and was stationed primarily in Gaeta, Italy, although he traveled to many seaports. He also remained in the reserves for 12 years. Born Rie Yoshinaga in Toyoura-cho, Japan on March 19, 1968. She was named after ??? Rie was a teacher in Japan for 3 years. This is where John and Rie first met and became just friends. John came back to the U.S. in September of 1997. Rie came to the U.S. to study the following January of 1998. After a long friendship they became girlfriend and boyfriend and subsequently married in 2000. In August of 2008 Rie moved to Tokyo, Japan with their son Sean. John will move within the next year to start a new life together. Born Louise Theresa Smith in New Bedford on September 15, 1919 and died in New Bedford on January 6, 2000. She was delivered at home as was the norm during this period. Born Eiko in Toyoura-ch, Japan on ????. She has two? siblings. 1 sister (need name and birthday/death) and 1 br0ther (need name and birthday/death). She was married on (need date) in City, Japan. They had 2 daughters - Rie and Mari (need b'day). Born Hiroshi in Toyoura-ch, Japan on ????. He has two? siblings. 1 sister (need name and birthday/death) and 1 br0ther (need name and birthday/death). .